We are currently in the process of rebuilding the boundary walls around the field in the middle of the wood. There have been a few trees blown down during the recent high winds and the ground is exceedingly muddy and waterlogged after all the heavy rain that we have had. We do attempt to keep up with removing of fallen trees and repairs to walls and fences as soon as we can. If you see any fallen trees that require attention or any trees that look in a dangerous state please report these to Raymond and Christine on 01484 656389 or by e-mail at [email protected]. Unfortunately during the last heavy rains the water from the spring near the entrance gate flooded out on to the path and ran down the path through the wood gouging out a furrow all the way down the path to the golf course. This problem has been reported to the council and photographs have been sent. we do not know as yet whether anyone from the Public Rights of Way dept at Kirklees will come out to inspect the damage or not! The Longwood Village Group "Woodchip" project is a woodland conservation and heritage improvement project based in Pighill wood adjacent to Outlane Golf Course. 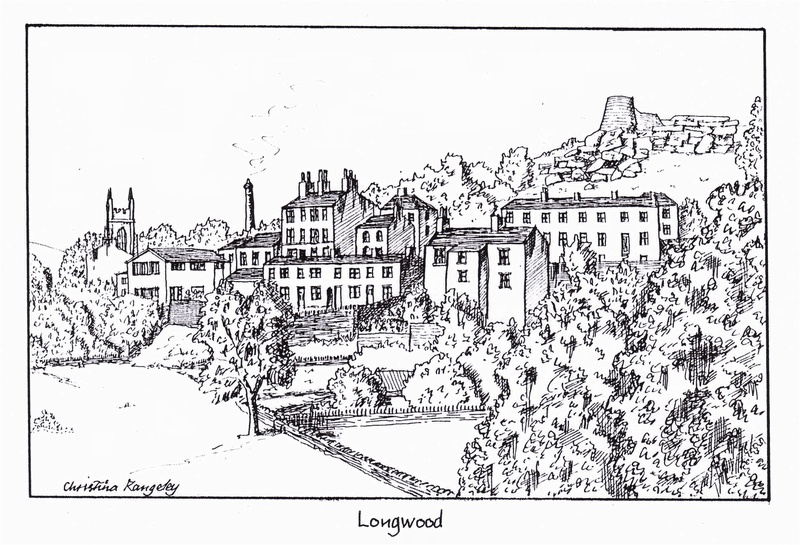 In 2005 Longwood Village Group obtained a grant from The Heritage Lottery Fund to start a woodland conservation project in Pighill wood which at the time was owned by Yorkshire Water but which had been neglected and abused for a long number of years and was in a very poor state. The woodland is in fact a plantation with all the trees of a similar age and because the woodland had not been managed they were very tall with a high and dense canopy that excluded light from the woodland floor so there was very little shrub and plant growth. Many of the trees were in an advanced state of decay and many were in a dangerous state. Many of the boundary walls were partly demolished and there were no obvious footpaths through the woodland. The LVG committee realised that if the woodland was not managed in the proper way that there was a good chance that sometime in the future it could possibly be lost as a suitable place for local residents to walk, relax and enjoy what should be a haven for wildlife. The lottery funding allowed us to prepare the way to produce a long term management plan for Pighill wood. The funding allowed us to carry out the following projects. *A full tree survey in the woodland determining the types of trees that were present in the wood and the ratios of the different types in both the east and west sectors. * An archeological survey through the woodland and the immediate surrounding area. * A bat, bird and mammal survey . *The purchase of various tools and equipment required for the volunteer working parties that would be rebuilding walls, erecting fences, rebuilding footpaths etc. *The purchase of fence posts, wire and stock fencing and for some sections of fencing the cost of hiring the services of a fencing professional. *The cost of the services of tree surgeons to remove some of the most dangerous trees from the site. Leaflets were distributed and posters were displayed informing people of the work that was to be undertaken and dates for working parties were organised. Volunteers were organised to undertake the tree survey and a start was made on rebuilding boundary walls and erecting fencing. Some volunteers walked the woodland removing accumulated rubbish, clearing up old camp fires and generally tidying up to make the area look more inviting. The wildlife survey that was undertaken highlighted the fact that we had some quite rare saproxylic beetles present in the woodland, these are beetles that live in decaying wood, so all the dangerous trees that were taken down were left in place to rot to encourage the continuing presence of these beetles. The wall alongside the main footpath into the wood at Nettleton hill was totally rebuilt and a new gate was put across the path to prevent any motorised vehicle from entering into the woodland. A length of stock fencing was erected along the side of the main track through the wood and a notice board was placed behind the fence. The notice board is used to show what wildlife one can expect to see in the woodland at different times of the year and also to inform people about the work of LVG and other events that are planned. 1. Repair work has had to be carried out on some of the stock fencing where fallen trees and branches have hit the wires and bent or broken them and several fence posts have been replaced as they had rotted at the base, there are still a few fence posts that need replacing. 2. 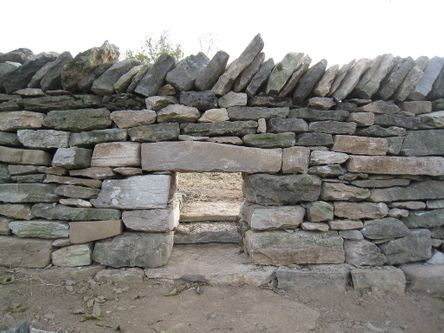 Work is continuing on the rebuilding of the dry stone wall round the edge of the central field, the top wall is now nearly complete. 3. Litter is a continuous problem as is the occasional camp fire but regularly walking through with a bin bag in hand, and with the help of others who do the same, we manage to keep on top of this problem. 4. We seem to be having a reoccurrence of the problem of cyclists digging up the wood and using wall stones to build ramps and jumps, we continue to demolish these and replace the stones and soil. We have had quite a few trees come down over the winter months and there are a lot of dead trees scattered about the wood. Barney Harle and Ian have been to the wood and sawn up some of these fallen trees and the resultant logs and branches have been stacked so as to provide a barrier to the bike activity and to provide cover for birds and a home for beetles and bugs. 5. Although verbal support has not been lacking and we have received lots of positive comments about what we are doing with the woodland, recent work parties have been very poorly attended so progress has been very slow, but we continue to do what we can when we can. 6. The woodland is currently looking in better health, with beds of ransoms slowly spreading and the bluebells and pink purslane currently in full flower. 7. We have a considerable number of young oak trees that are now big enough to consider planting in the woodland and we will be planting them during the autumn we will then be looking to grow on further trees for planting in the future.